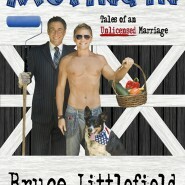 TV personality and best-selling author Bruce Littlefield has been hailed by the New York Times as a “lifestyle authority” and by NPR as “a modern day Erma Bombeck.” His next book The Sell, The Secrets of Selling Anything to Anyone, with Bravo Million Dollar Listing star Fredrik Eklund will be out in 2015. He divides his time between the Hudson Valley and NYC. Visit him at BruceLittlefield.com and follow him on Twitter at Bruceilla.